This image covers an area adjacent to the Cone Nebula complex which is just a few degrees to the est and a part of it is visible on the lower right. There are a lot of objects here (please see the annotated mouseover). 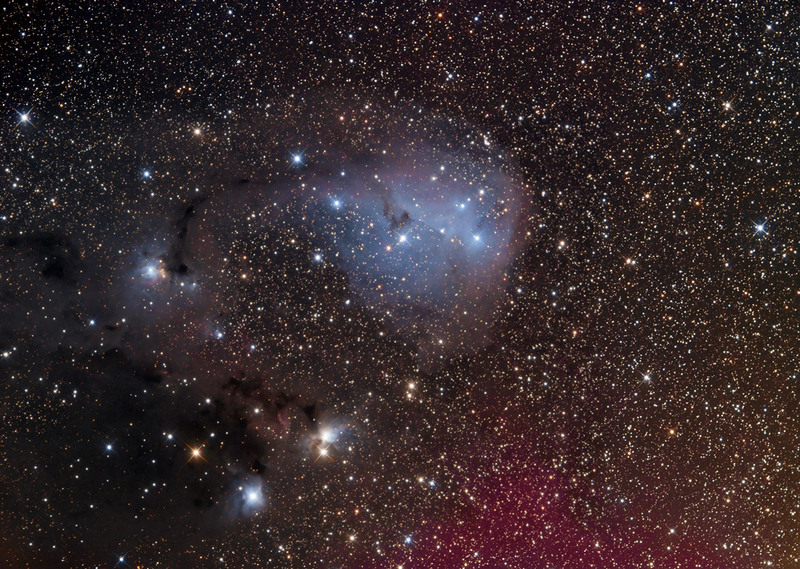 The most prominent of them is the reflection nebula IC 447 (also catalogued as IC 2169, Ced 78, DG 103, Bernes 96, LBN 903, LBN 201.69+00.05 and Magakian 197). It was discovered by E.E. Barnard in 1894, and later reported to John Louis Emil Dreyer, who compiled the New General Catalog (NGC) in 1888 and Index Catalog (IC) in 1895 and 1908. The nebula is in the middle of Monoceros R1, OB association located in the region of the molecular nebulous complex Monoceros OB1, together with Association Monoceros OB1 and other nearby nebulae. The distance of the region is estimated at 760 parsecs (2480 light-years), which puts it on the outer edge of the Orion Arm, near the interarm area between it and the Perseus Arm. The Monoceros R1 association has some blue stars of spectral type B and about 7,000 M⊙ of gas and dust clouds. VdB 77 is a small nebula superimposed on wider VdB 78, both are located on the southeast edge of IC 2169 and are illuminated by the star HD 258853 - a blue star of B3 class and magnitude 8.83, one of the brightest of the region. Other objects here is NGC 2247. Also a reflection nebula, it is located on the edge of the large dark nebula known as Barnard 37 (or B 37). The nebula surrounds the star HD 259431, also known as V700 Monocerotis, a brilliant massive Orion variable that fluctuates irregularly between magnitudes 8.62 and 8.91.